This image is taken in the Argonne region of France and shows an unnamed German cemetery set on the slope of a hill or a small ravine. A group of German soldiers are burying a comrade who has recently fallen on the field of battle. 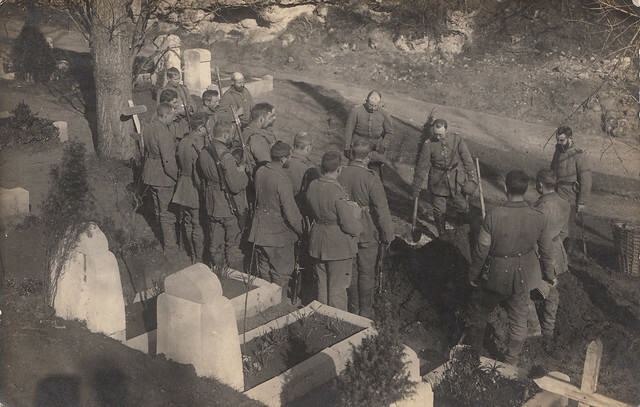 The men stand round the grave while an officer uses an entrenching tool to cast in some earth. It is an unusual photograph in many ways and one wonders who the fallen soldier was? you won’t find a better one. in the same pace and stride. meant for you or for me? like he was a part of me. while I’m just reloading my gun. This entry was posted on 08/01/2012 by sommecourt. It was filed under Argonne, German Army, War Cemetery, Western Front, WW1 . Makes me think of my grandfather buried in North France in late October of 1918, just 2 weeks before the war ended!